Variously dyed, stained, and painted, Eric N. Mack's textile assemblages are paintings—experiments in color, form, and gesture—that reflect and frame day-to-day experience through their commonplace materials and their arrangement in three-dimensional space. 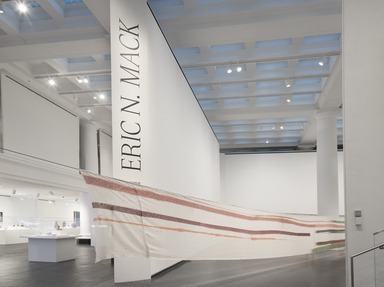 Eric N. Mack: Lemme walk across the room, a site-responsive installation of the artist's textile paintings and other works, extends his belief in painting as a living practice, responsive and multisensorial. 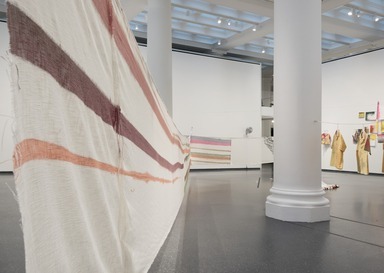 Eschewing the traditional cotton canvas and its rectilinearity, Mack (American, born 1987) began working with textiles, including bought and found multicolored fabrics, used clothing, and moving blankets, for their associations with daily life and the body. 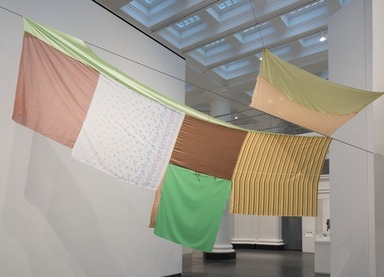 In draping what the artist calls "fabric collages," he exuberantly collapses the borders between painting and sculpture, while also evoking fashion, a medium that appeals to him for its framing of style and its possibilities for aesthetic experience within everyday interaction. Some of his works incorporate hand-stained pages from fashion, hip-hop, and other popular magazines, which explicitly refer to subcultures invoked in Mack's art and offer yet another alternative to the conventional painted surface. 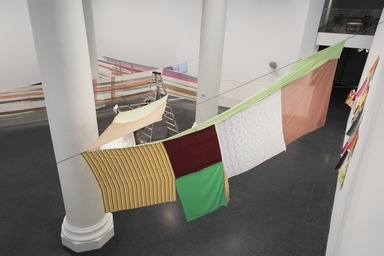 Hung and mounted in response to the architecture of the Brooklyn Museum's Great Hall, particularly the classical columns that ground the space, the works in Eric N. Mack: Lemme walk across the room encourage visitors' active engagement. 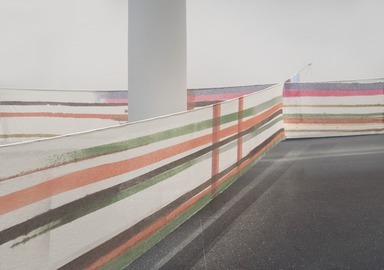 Moving alongside, through, and across these multihued, multitextured works, we do not just see painting but experience it—over time and through intimate encounters. 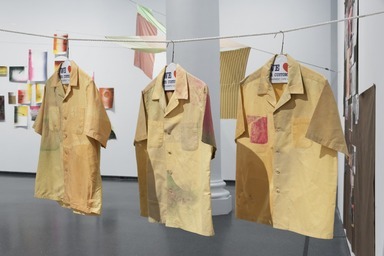 Though individual objects, these three hanging shirts were in fact made through a single process whereby the artist hand-dyed a continuous stretch of cotton fabric in yellow, red, and green pigments. Mack then collaborated with a seamstress to determine the shape of the garments, separately cutting and sewing the dyed cloth. Made in 2017, since then the shirts have been presented in a variety of configurations. This collage consists of works on paper made across a number of years. Some of them are process pieces, including the negative shapes resulting from the stencil dying process for Seat Pleasant. 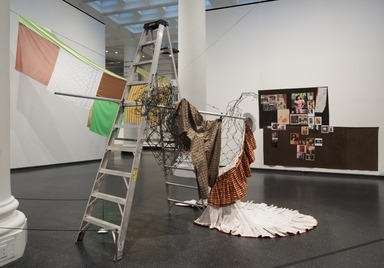 This assemblage stands at the intersection of sculpture, painting, and fashion. The use of the found ladder calls forth the history of the Readymade, the concept that arose out of unlikely, everyday, and even industrial sources. 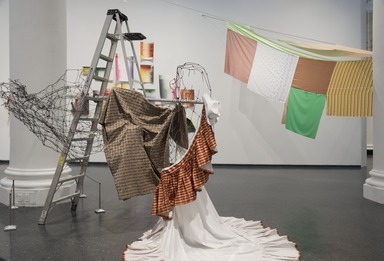 This particular ladder has further art historical resonance, as Mack found it during his stay at the South Florida Rauschenberg residency, an artist studio fellowship for those engaged in forward-thinking artistic process. The organically draped textiles approximate the body’s soft curves and contrast with the hard, angular materials of the ladder and pole. Here Mack has “styled” the textiles around the metal fencing, as would a fashion professional. Yet the metals and textiles also all share the language of the grid, an organizing principle important to the modern industrial, art, and fashion worlds alike. 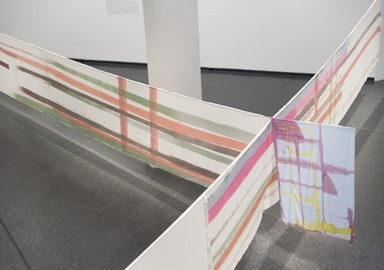 Suspended across the length and width of the gallery, Seat Pleasant encourages visitors to walk alongside the work, taking it in from different angles and intervals. 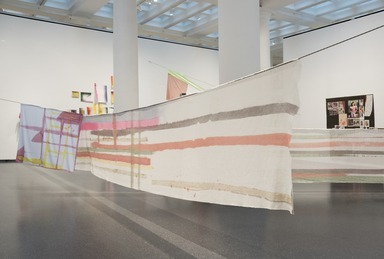 It continues the legacy of innovative artists like Sam Gilliam, who made the radical gesture of draping and otherwise suspending the canvas, rather than stretching it on wooden bar frames. 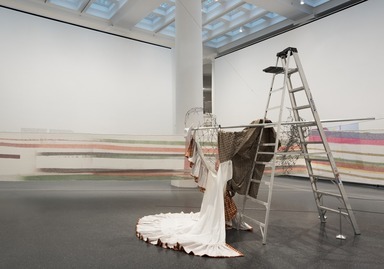 Doing so brought painting closer to the experience of everyday life, a move that Mack extends by using—and suspending—a material primarily intended for clothing. At points you can even see right through his gauzy cotton fabric. 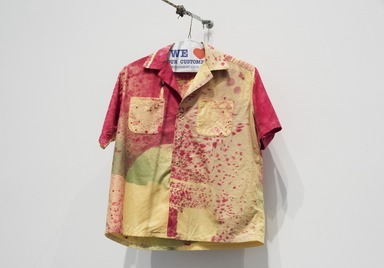 Seat Pleasant further displays the artist’s interest in blurring the distinction between painting and fashion. Here Mack replaces oil paint with dye. The oversized plaid pattern also doubles as a modernist grid. 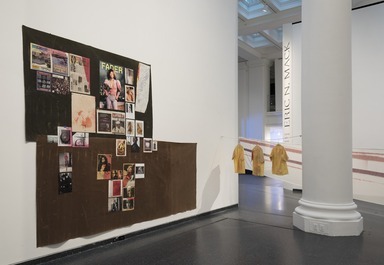 This collage features images sourced from various periodicals, including music and fashion magazines, such as Fader and Interview; international newspapers; and photography from the artist’s own collection. 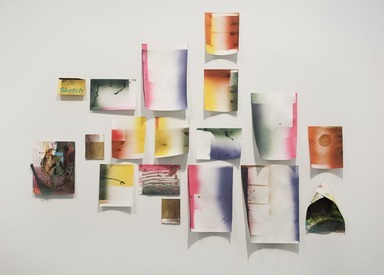 Sometimes referred to by Mack as “mood board” paintings, these collages are a gathering place for the artist’s many inspirations and reference points. For instance, occupying the surface are a number of full-page advertisements from fashion house Céline, what Mack calls an “elegy to Phoebe Philo,” the former creative director of the brand. Also found here are images of iconic R&B singers like Janet Jackson and Kelis, who are both known for their fearless self-fashioning. Each of these images exists both on its own and in relation to the others, letting a viewer make associations between “characters” as they see fit. 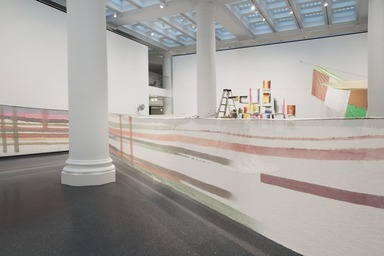 Though working here with representational images, the “mood board” remains within the language of painting: Mack variously soaks and stains the surfaces of some of the images as he does his textiles, and they are arranged with consideration for the modernist grid. 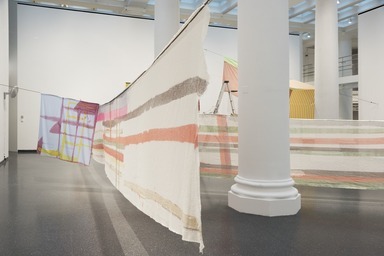 An example of what the artist calls “textile assemblage,” Tessuti Raponi (Ciao Milano) features various textile “scraps” the artist found at a fabric store in Milan and which he then arranged and sewed together. 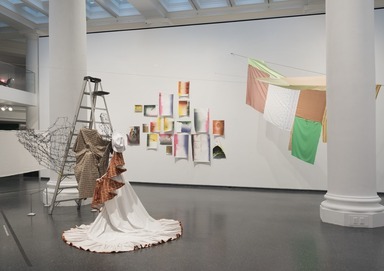 Here the distinctions between painting, sculpture, and fashion collapse, as the textiles provide color and pattern, and the assemblage as a whole expands into three-dimensional space. The tactility and dimensionality of the materials extend the work from mere abstract composition, removed from the figure, to a form that refers and relates to the body in real time and space.